Global Sports Brand PUMA continues their commitment to inspire women everywhere to stay true to themselves, and partnered with Cara Delevingne to premier the highly anticipated ‘DO YOU’ Docuseries at London’s Central Saint Martins College. Cara has spent several months seeking out and speaking directly to women with unique stories and a strong point of view on ways to change and improve our world. She has now partnered with PUMA to create a docuseries of four short films that cover topics from youth empowerment through poetry, to bullying, to self-defense. The ‘DO YOU’ Docuseries brings together a roster of strong women from different areas of interest, each telling a story of bravery and confidence. The ‘DO YOU’ campaign seeks to encourage women everywhere to have the confidence to focus on their strengths and make their world their own – because everyone deserves to be heard and to help bring change to their lives and the lives of others. The first film shows how Cara, with the help of UNHCR, the UN Refugee Agency, was able to travel to northern Uganda to visit several of the refugee settlements located there. She speaks about her moving experience, and her motivation to work to make a change in the lives of young women everywhere. In the second episode, she meets with Monique, Alexis and Violeta from Get Lit, a group of girls that use poetry to increase literacy and empower youth in Los Angeles. For episode number three, Dr. Ryhana Dawood, founder and instructor of Martial Smarts, teaches Cara a powerful lesson in self-defense. In the final episode we meet Natalie and Daniella, who share their first-hand experiences with bullying and how they have overcome a difficult chapter in their lives. PUMA and Cara have also partnered to design two unique sneaker laces that will be available from the 27th of July in the US and Europe. 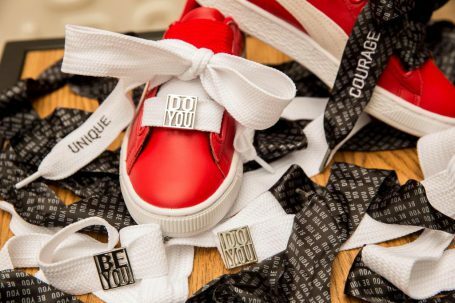 The sale of the ‘DO YOU’ Basket Heart laces will benefit the UNHCR, an organization close to Cara’s heart and with whom she collaborated with on her original volunteer trip to Uganda. For those individual voices that want to be part of Cara’s ‘DO YOU’ movement, she and PUMA are inviting everyone to share their stories with the hashtag #DoYouStories. She will select 10 women from all story contributors who will meet with her personally to speak more about their experiences, inspiration and dreams. … I raise my voice for those who can’t be heard… DO YOU? …I am not going to be silent… DO YOU? …I want to inspire others to become empowered… DO YOU?